The Michigan State University Police Department has upheld a long tradition of courtesy and excellence by hiring talented officers with the highest standards of performance. If you have the leadership, integrity and honor required for a law enforcement career, we want you to join our team. Check out our recruiting website. The MSU Police Department offers a variety of excellent opportunities for persons seeking a position in a non-law enforcement career. Those include: parking services, cadets, records office, information technology, traffic engineering, business office, and access control. If you are interested in learning more about those positions, use the contact information on this page. 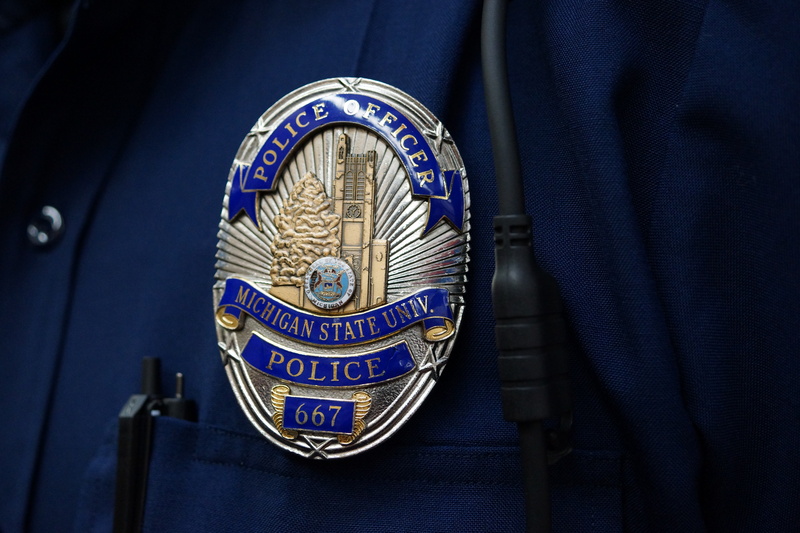 The MSU Police Department provides excellent opportunities for students seeking law enforcement experience and civilians looking for part-time work. The Eli and Edythe Broad Art Museum is a contemporary art museum located on the campus of Michigan State University. The MSU Police Department provides security operations for all exhibitions on a daily basis. MSU Police officers are responsible for the safety and well-being of the employees and visitors in the museum using a civilian security staff. If you are interested in applying for a part-time security job, please utilize the application provided on this page. Museum Security positions were created to assist the MSU Police Department in providing property protection and visitor safety for the Eli and Edythe Broad Art Museum. The main functions of Security are access control and loss prevention. There are some special events that extend evening hours on the weekend and/or require opening earlier in the day. During the school year, shifts are broken down into three shifts Monday-Friday and two shifts on Saturday and Sunday. During the summer semester break, shifts are reduced to only two shifts each day. The positions are all part-time and students are encouraged to apply. The Department has a policy restricting student employees from working more than 25 hours per week; and restricting non-student employees working more than 19 hours per week. Any other part time MSU job must be included in that weekly hour limit and disclosed to the Department. Applications are accepted at any time, but only filled when there is a vacancy. When an opening becomes available, if you meet these pre-screening requirements, qualified applicants will be contacted by telephone or email and scheduled for an initial interview. Applicants who are deemed ineligible for an interview, or who fail to successfully complete the interview, will be notified by e-mail. If there are no open positions, applications will be kept on file. Please do not contact the Department to inquire on the status of your application. If you have any questions regarding the position, requirements, or process; please contact the officer assigned to this facility. The MSU Police Department provides security services for the FRIB. MSU Police oversees homeland security, emergency management, and first responder issues for the laboratory. Supervised by the MSU Police Department, a civilian security staff is utilized to help maintain a secure environment at the FRIB. If you are interested in applying for a part-time security job, please utilize the application provided on this page. The FRIB Security Staff was created to assist the MSU Police Department in providing property protection for the FRIB facility and work-site. The main functions of the FRIB Security Staff are monitoring access controlled areas and intellectual, personal, and real property protection. Greencoat security works a variety of locations and at special events occurring at MSU. If you are interested in applying for a Greencoat security position, please complete the application process found on this page. If you are interested in applying for a part-time security job, please utilize the application provided on this page. Greencoat Security is assigned to shifts that could encompass any time of day or day of week. Sign-up options are available to allow you to volunteer for work assignments. However, ALL Greencoats must work MSU Home Football Game weekends, or similar type high-volume events. Applications are accepted at any time, but only filled when there are vacancies. Primary hiring occurs during the summer semester, with training occurring before classes resume in the fall semester. For Fall 2018, you must be available to attend training on both 8/22/2018 and 8/23/2018 from 8:00am-5:00pm. That training is required before working as Greencoat security and you are paid to attend. Also, if you need to move-in early to your residence hall to attend the training, those provisions can be made in advance. When an opening becomes available, if you meet the pre-screening requirements, qualified applicants will be contacted by telephone or email and scheduled for an initial interview. Applicants who are deemed ineligible for an interview, or who fail to successfully complete the interview, will be notified by e-mail. If you have any questions regarding the position, requirements, or process; please contact the officer assigned to oversee these employees. The Traffic Worker position was created to assist the MSU Police Department with special events hosted on campus throughout the school year. The focus of the Traffic Worker is to assist with traffic control and parking during special events, as well as provide customer service to those attending these events. If you are interested in applying for a part-time security job, please utilize the application provided on this page. Traffic Workers can work year round, however; the bulk of the hours occur during football season. Traffic Workers work a variety of shifts and the length of the shift will depend on the event scheduled. The events and shift can occur anytime and any day of the year (NOTE: During the “school day,” shifts may be lengthened or shortened to accommodate class schedules). On average the football games run 8-12 hours, Men’s Basketball is usually 8 hours, hockey and Women’s Basketball games are usually 4 hours. Everyone is required to work during the home football weekends; a Traffic Worker may have a game assignment or cover an overnight assignment during those weekends. Applications are accepted at any time and if you meet the pre-screening requirements, qualified applicants will be contacted by telephone or email and scheduled for an initial interview. Applicants who are deemed ineligible for an interview, or who fail to successfully complete the interview, will be notified by e-mail. Please do not contact the Department to inquire on the status of your application. The Accountability Check-In Worker position was created to assist the MSU Police Department with checking in staff, volunteers and event workers for various events at Michigan State University. The focus of this position is to verify the identity of the individuals who will be working and/or volunteering at university events. If you are interested in applying for a part-time security job, please utilize the application provided on this page. This is a year round position that has a varied schedule and will require availability during early morning, nights, weekends and holidays. Shifts are typically scheduled in five hour increments with varied start times. Accountability Check-In Worker positions are all part-time and due to the nature of the event scheduling; there are no typical number of hours worked each week. This position requires moderate physical effort and involves sitting and/or standing for extended periods of time and the use of a laptop or other computer device. Everyone is required to work during the home football weekends. Have some understanding of basic computer skills, such as Microsoft Excel and Microsoft Word. The Police Service Desk, staffed by student Cadets, serves as the central hub of the Michigan State University Police Department, receiving phone calls and walk-in customers. In addition to handling incoming phone calls and walk-ins, Cadets also monitor the University’s fire and intrusion alarm systems, monitor police radio traffic, take reports and provide general assistance and information to the campus community and visitors. If you are interested in applying for a part-time security job, please utilize the application provided on this page. Cadets work eight-hour shifts, providing coverage to the Police Service Desk twenty-four hours a day, 365 days a year (NOTE: During the academic “school day,” shifts may be lengthened or shortened to accommodate class schedules). Cadets typically are scheduled for a minimum of two eight-hour shifts per week, depending on demand. During a shift, Cadets may sit or stand and are required to stay in position at the Police Service Desk, unless relieved by another Cadet or Supervisor. As the first level of contact for the department, Cadets are expected to maintain the utmost level of courtesy and professionalism. Additionally, Cadets should possess the ability to multi-task and be able to perform their job duties during emergency situations. Everyone is required to be available to work during the home football weekends and similar high-volume events. The Department has a policy restricting student employees from working more than 25 hours per week. Any other part time MSU job must be included in that weekly hour limit and disclosed to the Department. NOTE: Due to the extensive amount of training incumbent to this position, preference may be given to candidates of freshmen or sophomore status. Applications are accepted at any time, but only filled when there are vacancies. When an opening becomes available, if you meet the pre-screening requirements, qualified applicants will be contacted by telephone or email and scheduled for an initial interview. Applicants who are deemed ineligible for an interview, or who fail to successfully complete the interview, will be notified by e-mail. If you have any questions regarding the position, requirements, or process; please contact the person assigned to oversee these employees. The focus of the Parking Enforcer position is to assist with parking concerns, as well as provide customer service to our community. If you are interested in applying for a part-time job as a Parking Enforcer, please utilize the application provided on this page. Assisting motorists, i.e., jump starts for dead batteries, cutting off bike locks, etc. Parking enforcers can work year round. Parking enforcers must accept the job knowing they may work early morning, nights, overnights and weekends. Parking Enforcers usually work 5 hours shifts and those shifts are worked completely around your class schedule for that semester. There are no typical number of hours worked. Everyone is required to be available to work during the home football weekends and similar high-volume events. Access Control Assistants perform Access Control duties related to the MSU alarm system and doors around campus. Assistants provide key runs to qualified individuals following a specific protocol and Assistants will maintain the key storage cabinet and the Department’s gun storage closet. You may be asked to perform minor data entry and assist with occasional filing and paperwork. As a base level of contact for the department, Access Control Assistants are expected to maintain the utmost level of courtesy and professionalism. Additionally, Access Control Assistants should possess the ability to self-task and be able to perform their job duties without a direct supervisor present. These employees work rotating six-hour shifts including midnights, weekends and holidays. Access Control Assistants will be expected walk or drive to multiple locations in response to the MSU Access Control Alarm System. Everyone is required to be available to work during the home football weekends and similar high-volume events. Parking Services Office Aides perform office duties related to the MSU Police Department’s Parking Services operations. Aides may be asked to perform data entry, clerical functions and assist with filing or other similar paperwork. Perform duties associated with maintaining an office, i.e., answering phones, monitoring technology, etc. As a base level of contact for the Department, Parking Services Office Aides are expected to maintain the utmost level of courtesy and professionalism. Additionally, Aides should possess the ability to self-task and be able to perform their job duties without a direct supervisor present. These employees work during business hours when the Parking Services Office is open to the community. There is the potential need to be available to work during the home football weekends and similar high-volume events.